I love people who blog. What did we all do without them? I find them so informative, it's like a friend sharing an idea or an experience with you. I always love a good story! We had someone come into the shop the other day, I didn't get to see them, so I was unaware who it was. The girls brought back this candy jar and on it said 'courtesy of a random act of kindness'. 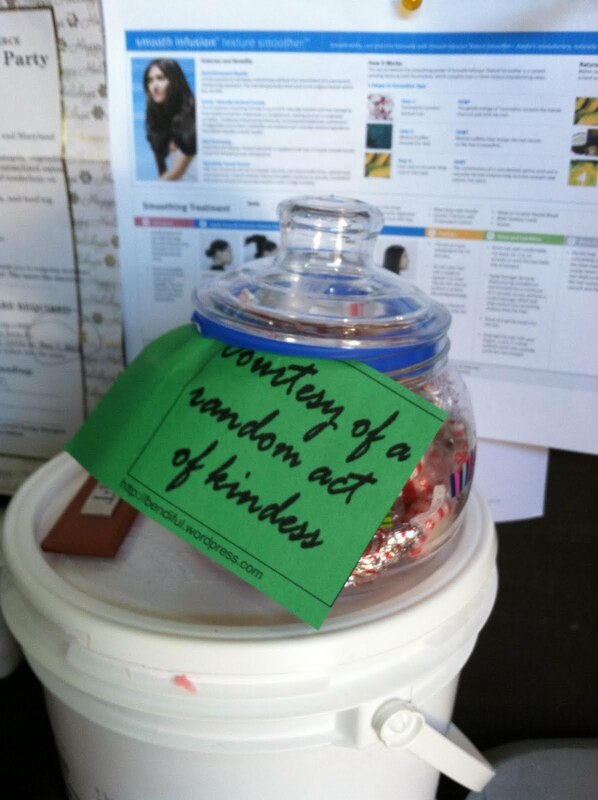 What I love more than blogs and people who blog...IS RANDOM ACTS OF KINDNESS!! Oh and paying it forward..and Karma! I love all those things. They govern my life, they should govern everyone's lives..it will be more peaceful and kind! In this town, I witness everyday examples of paying it forward and random acts of kindness. In my home I see them, in my business I see them. I see them everywhere. Sometimes I see not nice things too, but then I see Karma, because almost always, what comes around goes around! Anyway, I digress. SO on to where Bijou was spotted! One of our creative genius types that come into the salon, who I love to share APP joy with. She also has a blog, it's very informative with the right amount of fluff. I LOVE that!